Ed Kilgore, Josh Marshall and Kevin Drum each had posts today basically declaring Marco Rubio’s (R-FL) 2016 presidential aspirations dead after immigration reform has stalled in the house. Marshall says so defiantly. Kilgore believes that, after “settling” for candidates that were too moderate in 2008 and 2012, the Republican base will stay away from Rubio in ’16. Drum agrees, but adds that Rubio is young and has potential in 2020 and 2024. I agree with all of that, but I want to expand the scope of this beyond just Rubio. Every senator with presidential aspirations – from Rubio to Ted Cruz (R-TX) to Rand Paul (R-KY) – is going to face the same critique from the general public: you haven’t done anything. 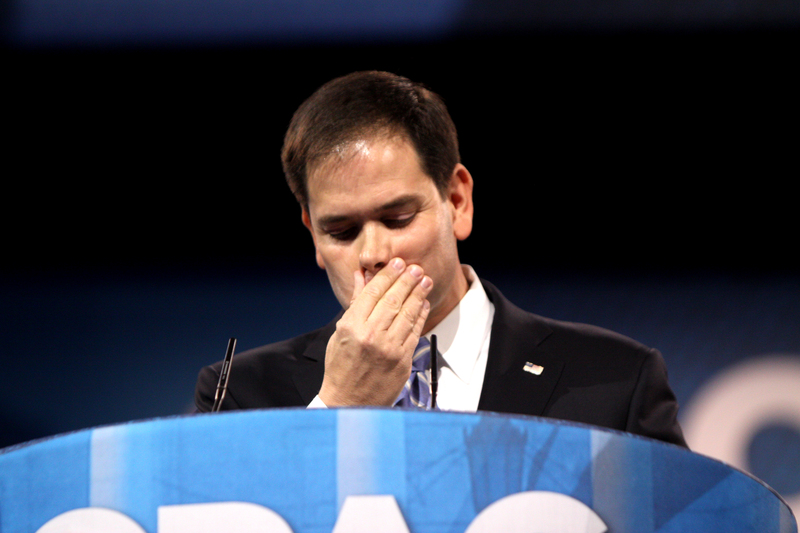 Rubio’s 2016 presidential chances are falling. It’s well known that Americans disapprove of Congress by large numbers. They also blame both sides for the gridlock, although the GOP gets slightly more of the blame in most polls. This presents a big problem for Republican presidential candidates over the next couple of years. How can they continue obstructing the Senate without continuing to seem like they’re the ones to blame? Rubio has seen over the past few weeks what happens when a senator steps across the aisle and tries to accomplish anything. Whatever passes the Senate is unacceptable to House Republicans, who are content to let the legislation die. Now Rubio faces the wrath of the base without anything to show moderates or Hispanics. That’s why Kilgore, Marshall and Drum have dug a grave for his 2016 presidential ambitions. We’re only six months into Cruz’s Senate career and it’s easy to rouse the base by refusing to compromise at the beginning. But at some point, most voters are going to want to see Cruz actually try to pass a law. The current Ted Cruz could certainly win the Republican primary, but he wouldn’t have a chance in the general election, because he won’t appeal to independents whatsoever. Three and a half more years of obstruction will just turn them off more. That’s Republican senators’ problem: anyone in Congress will have trouble winning an election in 2016. It’s a lose-lose proposition for Republican Senators. If you support major legislation, help it get passed with bipartisan support and thus prove to moderates you’re willing to compromise, then the House will kill the bill (preventing you from taking credit), the Tea Party will withdraw their support and you will lose in a Republican primary. If you don’t support any legislation and just spend time arguing against all proposed policies, then independents will see you as an obstructionist who can’t govern. You’ll have Tea Party support, but moderate Republicans will be wary of your electability. If you do survive a primary, the Democratic candidate (likely Hilary Clinton) will beat you in the general election. Rubio will top the list of 2016 Republican presidential candidates if immigration reform passes, but it’s unlikely it will. He took option one and lost. Cruz and Paul are eventually going to have to make a decision as well. Will they contribute to any policymaking and attempt to endear themselves to independents looking for compromise? Can they find a piece of legislation that is worth risking Tea Party support? Or will they continue to obstruct everything in the Senate, fight for support of the base and worry about pivoting in the future? That’s what makes any Republican congressman’s presidential campaign (pre-campaign in this case) so challenging. Anyone from the Senate faces structural political challenges that are nearly impossible to overcome. Rubio has already been taken down by them. Who will be next?